There is no American station wagon sold here in the good old US of A, and for those of us who yearn for brown diesel manual transmission wagons (BDMTW, to you folks in the know), from America, this is A Problem. GM's Mark Reuss also thought this was A Problem, and good news! He still does. Back in November, Mark Reuss was GM's head of North America, and he said he wanted a wagon, which is great, but without wood panelling, which is not so great, but maybe he hit his head or something mid-sentence. It happens. Reuss was recently appointed head of product development at GM, though, and GM's got a new CEO, so maybe as the guy who's in charge of actually bringing things to market, he's gone a bit soft on us. A bit more pragmatic, if you will. I still think no one's offered a really good, affordable wagon in the United States. You know, mainstream, fun, good-looking, hot-looking, fun-to-drive wagon at a reasonable price point. There's a lot of wagons in the market, but they're really expensive and there's a lot of people that can't afford that, and I think there's an opportunity there. This is pretty much bang-on with what Reuss said a few months ago, but when people are put in new positions and given new bosses, their words can change pretty fast. So the fact that Reuss isn't singing a new tune is great news. But what sort of wagon should we expect? 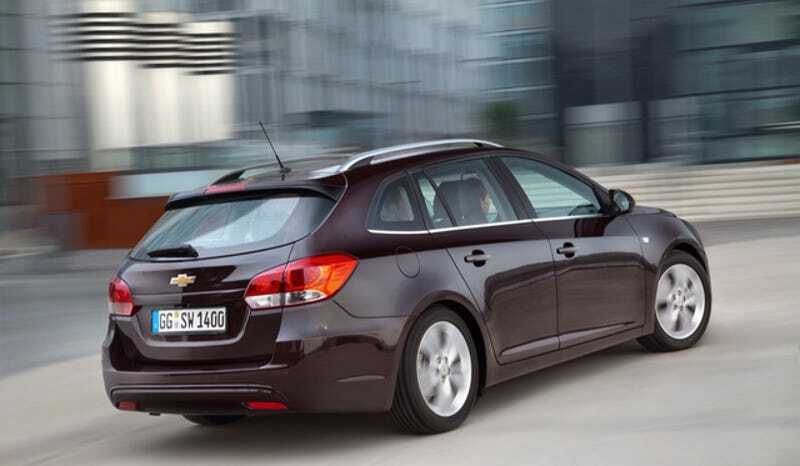 One like the Cruze wagon pictured above, that's sold pretty much everywhere that isn't the Americas? Or maybe a Malibu wagon, or heck, even an Impala wagon? I'd love an Impala wagon. Let's see if we can thing of a name for it... the Chevy No-fat-crossovers? The Chevy No-beige-sedans? Well I like the "No" part, but making an Impala wagon might be a little crazy at this point in the market. You might even say it's a bit mad. That's it! We'll call it the Chevy Nomad. What a genius idea, that I just had, and nobody else. Mark, bravo on sticking to your guns, and you know where to send the checks on the whole name thing. Just make sure I can get one with wood panelling.